The OMEGA™ FP7001A paddlewheel flow and temperature sensor is ideal for accurate monitoring of typical industrial water flows, hard-to-handle corrosive aqueous solutions, and high purity fluids . The FP7001A utilizes a paddlewheel-like rotor whose motion is converted into a high-level square wave pulse output by an open collector Hall effect sensor. Pulse amplitudes from 5 to 18 V are possible, depending on input power. The FPW-15 120 Vac converter plugs directly into a wall socket and outputs a regulated 15 Vdc at 400 mA. The DPF700 Series panel meter supplies power for the flow sensor and provides rate indication, or totalization and batch control (when ordered with the dual relay option). When ordered with the analog output option, the DPF700 can be used to interface the FP7001A flow signal to such items as strip chart recorders, dataloggers, and computer interfaces. 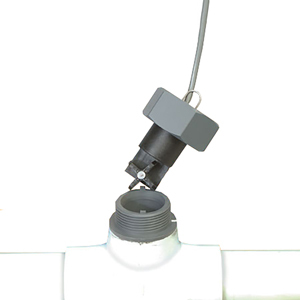 The system consists of the flow sensor, an installing fitting, and the electronics. The PVC tee fittings are supplied with a PVC locking nut, and the galvanized iron tee fittings are supplied with a brass locking nut to provide secure metal-to-metal mounting to the threaded brass insert. The FP7001A is not compatible with FP-5300 or FMG-5300 Series installation fittings. When powered by the FPW-5 five Vdc wall socket converter, the FP7001A has a TTL level pulse output which can be used with a variety of pulse input flow indicators, signal conditioners and controllers. It is not compatible with the FPM 5500/5740. Wetted Materials: FP7001A sensor: polypropylene body, PVDF paddle, FKM O-ring, 316SS shaft. Galvanized iron tee includes brass insert and locking nut. PVC tee has PVC insert and locking nut. 참고: Comes with operator's manual.